The nation’s move toward rejection of the policies of President Trump and his advisers, including Steve Bannon, began with the results of Tuesday’s elections in New Jersey and Virginia. The New Jersey race was easier to predict and it’s an important Democratic pick-up of a governorship. Congratulations to Phil Murphy, the next governor of the Garden State. Virginia appeared to be more of a cliffhanger. Hillary Clinton won the state by five points last year and we knew if voters in Richmond and Northern Virginia came out Democrats would win. Polling in the last month was all over the place. One showed Gillespie up by one and another had Northam up by 13. In both primaries the polls were way off. They had Northam in a nailbiter and he won by 10, and Gillespie in a rout and he eked out a win by one. Thankfully, Virginians didn’t buy Gillespie’s negative commercials and understood if he won it would add validation to the pig in the White House. So congratulations to Dr. Ralph Northam for his big win and thank you to the voters of Virginia who made a statement with their votes; Americans are not going to accept the alt-right or any candidate who refuses to stand up for decency and call out those who don’t. A healthy majority proved we are better than that. Congratulations also to Justin Fairfax and Mark Herring for their wins as lieutenant governor and attorney general. 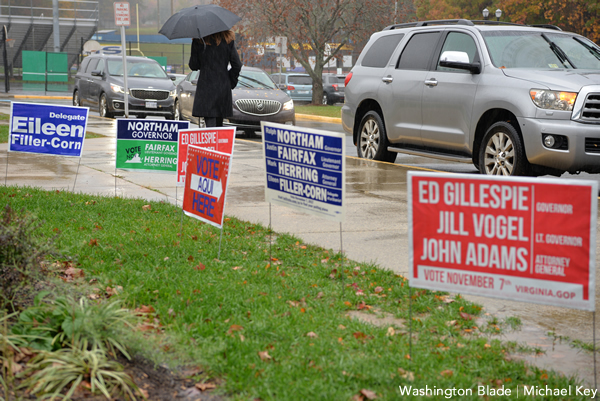 Virginia continues its string of electing only Democrats to statewide offices. All you can say is wow to the tremendous pickup of seats in Virginia’s General Assembly. Maybe the greatest victory in Virginia was seeing transgender candidate Danica Roem soundly defeat Bob Marshall who was called the ‘poster boy’ for homophobia, sexism and racism. The majority of voters in Prince William County no longer share his views or want to be known for them. With an incredible pick-up of at least 14 seats it looks like the House of Delegates is now 50/50. There is also work to be done by Democrats across the board; from school boards, to town councils, to mayors. The Democratic Party should be building a bench of candidates who will be our future leaders. What must stop is the fighting among some of the Democratic Party’s current elder statespersons and one independent who caucuses with Democrats. What must end is the continued talk as if they are the future, which they are not. Some are still in office like Sen. Bernie Sanders (I), who joins the Democratic caucus but declares over-and-over, “I am not a Democrat”; and Sen. Elizabeth Warren (D-Mass.) who continues to fight for consumers and the middle class. By 2020, Warren will be over 70, Sanders nearly 80. Former Vice President Biden, who is raising money for his PAC, will be nearly 80. They all need to follow Hillary Clinton’s example and say they aren’t going to run for higher office. Clinton has said clearly her future is to fight for women and children, support other candidates, and not be a candidate herself. Those in and out of office must help prepare the next generation for leadership by using their tremendous wealth of experience and wisdom to boost others into prominence. That is how to build a winning Democratic Party for the future — a party that will have many ready to lead and win elections at every level. The Democratic Party must continue to have a diverse leadership that understands the needs of voters because they have lived them and became leaders in their communities. The party will remain the party of progressives because of the hard work of the leaders we have today. The party of Jenny Durkan who becomes the first openly lesbian mayor of Seattle and Andrea Jenkins from Minneapolis who becomes the first out trans person to win a Council seat in a major U.S. city. So on to 2018 and winning up and down the ballot. Those wins will represent the American people’s rejection of today’s Republican Party; the Tea Party of the alt-right, Trump, Ryan, McConnell and Bannon.